Click to view a list of all the pending tournaments from which to make your choice. 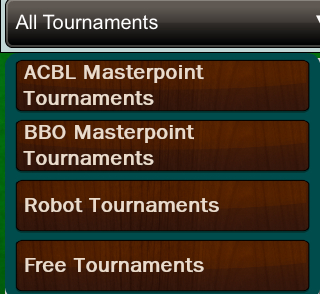 Narrow down your choice by clicking one of the four options or scroll through the list of all tournaments. Use the Search option to type in a key word. The keyboard pops up and you tap out the search term, and the list automatically begins sorting based on your keywords. Keywords would include a tournament host's username (for example, your friend is hosting a tournament and you want to play in their game); you want to play in a robot tournament but only Rebate games, or Best Hand; you want to play in a specific private tournament organization's games. Tap the Clear button to do a new search. The first line shows an entry fee (if any), the name and number of the tournament, and the tournament host. The next line shows a very brief description. The third line shows the number of registered players, and time remaining until the game begins. Click the Register button to sign up for the game you have selected. A successful registration for a tournament has a yellow background. Click the Register button with a yellow background to cancel a registration. If you know who you want to invite, type their username in the space and click Invite. You agree to pay your entry fee and your partner will need to agree to their own entry fee. Need a partner? Review players signed up in the partnership desk. To the right of usernames list is the payment option selected by people on the partnership desk. By clicking Invite next to a username you are agreeing to the payment option selected by your prospective parter. 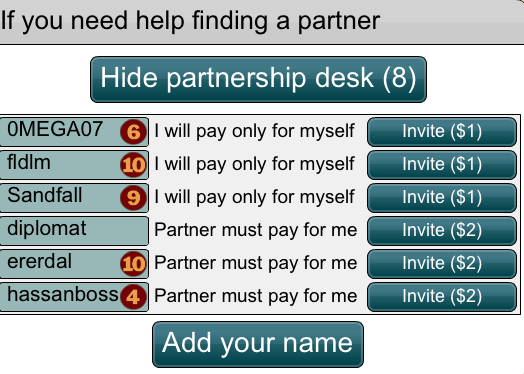 Click Add your Name to join the partnership desk, and make your own payment option selection. Click Cancel to exit this screen. 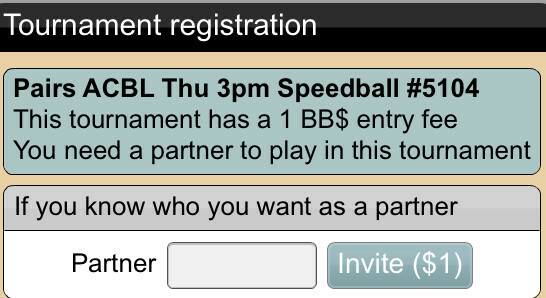 To register for a free individual tournament, click the Register button on the tournament description in the list of pending tournaments and then click Register to Play! To register for a tournament with an entry fee, click Register button the tournament description in the list of pending tournaments, and then click Register to Play! By registering you agree to pay the entry fee when you are seated at the tournament and play begins. When it is your turn to bid, the bidding box appears on your screen, above the cards. To bid, tap a number, then a suit symbol. For example, to bid 2 Hearts tap number 2, then ♥. To make an alerted bid, tap Alert, type in the explanation, then tap the bid as described above. To request a bid explanation, tap the bid. A box pops up for the player to type the explanation. Tap a card to play. Red means vulnerable, and white means non-vulnerable. Here E/W is vulnerable, N/S is not vulnerable. Tap the "Back" button at the top to leave the table. Tap the down arrow in the upper right part of the screen to bring up the menu for viewing the convention card posted for the pairs. Tap to view the card for NS or EW pairs. 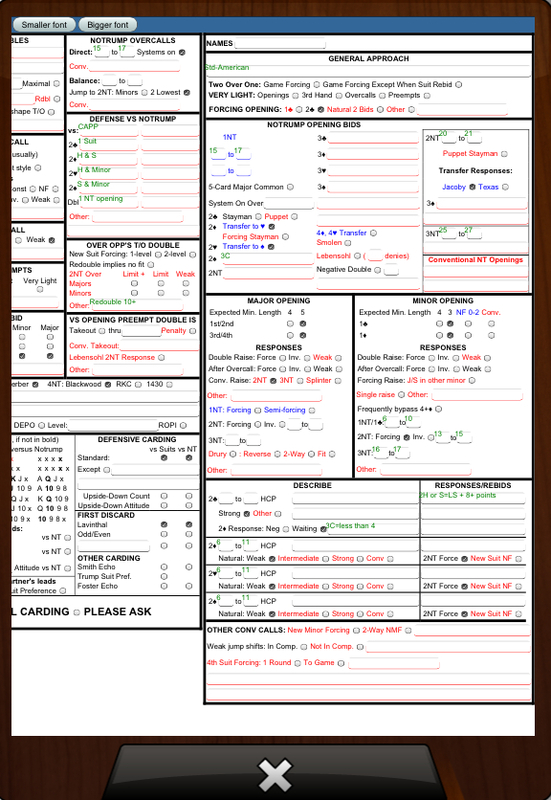 There are two styles of convention cards and the card posted for the pair while logged in with our official web version or the older downloaded Windows version of the program will be reflected in the card style visible on the tablet. Tap the "X" at the bottom of the card to close the window.